In recent years, race and ethnicity have been the focus of theoretical, political, and policy debates. 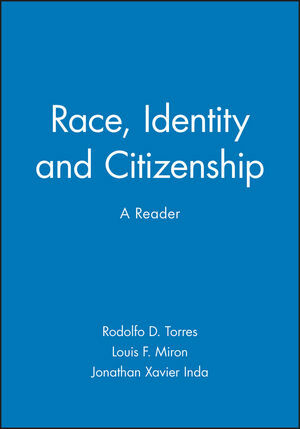 This comprehensive and timely reader covers the range of topics that have been at the center of these debates including critical race theory, multiracial feminism, mixed race, whiteness, citizenship and globalization. Contributors include Angela Davis, Stuart Hall, Richard Delgado, Robert Miles, Michael Eric Dyson, Saskia Sassen, Etienne Balibar, Patricia Hill Collins, Renato Rosaldo, Stanley Aronowitz, and Collette Guillaumin. Rodolfo D. Torres is Professor of Latino Studies and Public Policy at California State University, Long Beach and Visiting Professor of Political Economy and Social Policy in the Department of Education at the University of California, Irvine. He is co-author of Latino Metropolis: Racialized Relations in Postindustrial Los Angeles (1998), and co-editor of The Latino Studies Reader: Culture, Economy, and Society (Blackwell 1997), as well as co-editor of New American Destinies: A Reader in Contemporary Asian and Latino Immigration and Latinos and Education: A Critical Reader. He is currently on the editorial boards of The Latino Studies Journal, Socialist Review, Social Justice, and New Political Science. Louis F. Mir¢n is Chair of the Department of Education and Director of the Center for Collaborative Research in Education at the University of California, Irvine. He is author of The Social Construction Urban Schooling (1996) and Resisting Discrimination (1997). He has been a frequent commentator in both the print and broadcast media on educational issues of local and national interest. Jonathan Xavier Inda is an anthropologist and Assistant Professor in the Department of Chicano Studies at the University of California, Santa Barbara. He was previously a Visiting Scholar in the Department of Anthropology at the University of California, Irvine. His research interests are in race and ethnicity. Part I: Mapping The Languages of Racism:. 1. Does "Race" Matter? Transatlantic Perspectives on "Race Relations": Robert Miles and Rodolfo D. Torres. 2. I know it's not nice, but..."The changing face of 'race'": Colette Guillaumin. 3. The contours of racialization: Private structures, representations and resistance in the United States: Stephen Small. 4. Marxism, racism, and ethnicity: John Solomos and Les Back. 5. Postmodernism and the politics of racialized identities: Louis F. Mir¢n. Part II: Critical Multiracial Feminism:. 6. Theorizing difference from multiracial feminism: Maxine Baca Zinn and Bonnie Thornton Dill. 7. Ethnicity, gender relations and multiculturalism: Nira Yuval-Davis. 8. What's in a name? Womanism, black feminism, and beyond: Patricia Hill Collins. Part III: Fashioning Mixed Race:. 9. The colorblind multiracial dilemma: Racial categories reconsidered: John A. Powell. 10. Multiracial Asians: Models of ethnic identity: Maria P. P. Root. 11. Cipherspace: Latino identity past and present: J. Jorge Klor de Alva. Part IV: The Color(s) of Whiteness:. 12. Establishing the fact of whiteness: John Hartigan, Jr.
13. Constructions of whiteness in European and American anti-racism: Alastair Bonnett. 14. The labor of whiteness, the whiteness of labor, and the perils of whitewashing: Michael Eric Dyson. 15. The trickster's play: Whiteness in the subordination and liberation process: A¡da Hurtado. Part V: Cultural Citizenship, Multiculturalism, And The State:. 17. Cultural citizenship, inequality, and multiculturalism: Renato Rosaldo. 18. Cultural citizenship as subject making: Immigrants negotiate racial and cultural boundaries in the United States: Aihwa Ong. 19. The site of class: Edna Bonacich. 20. Between nationality and class: Stanley Aronowitz. 21. Class racism: Etienne Balibar. Part VII: Globalized Futures And Racialized Identities:. 22. Multiculturalism and flexibility: Some new directions in global capitalism: Richard P. Appelbaum. 23. Analytic Borderlands: Race, gender and representation in the new city: Saskia Sassen. 24. Globalization, the racial divide, and a new citizenship: Michael C. Dawson. 25. Interview Stuart Hall: Cultural and power: Peter Osborne and Lynne Segal. 26. Angela Y. Davis: reflections on race, class, and gender in the USA: Lisa Lowe. * Offers a wide ranging exploration of issues organized around recent sociological, historical, cultural studies, and ethnic studies scholarship. * Advances the theoretical and policy debates about 'race' in a changing society in the United States and Europe. * Contributors include Angela Y. Davis, Stuart Hall, Richard Delgado, Robert Miles, Michael Eric Dyson, Saskia Sassen, Etienne Balibar, Patricia Hill Collins, Renato Rosaldo, Stanley Aronowitz, and Collette Guillaumin.